Long before the phrase “Great Bear Rainforest” was dreamed up by environmental activists, David Garrick – better known as Walrus – had set up camp to protect the region’s ancient trees from logging. An anthropologist and one of the founders of Greenpeace, Walrus has been ensconced on the site he calls Earth Embassy on Hanson Island for so long he has come to resemble a woodland spirit, with his green felted hat, wild eyebrows and flowing silver mane of hair. In 1982, he launched a campaign to stop logging on Hanson Island on behalf of the Kwakwaka’wakw First Nation. He knew from the start what others would take many years to recognize: Protecting old growth forests on B.C.’s coast requires collaboration with First Nations. 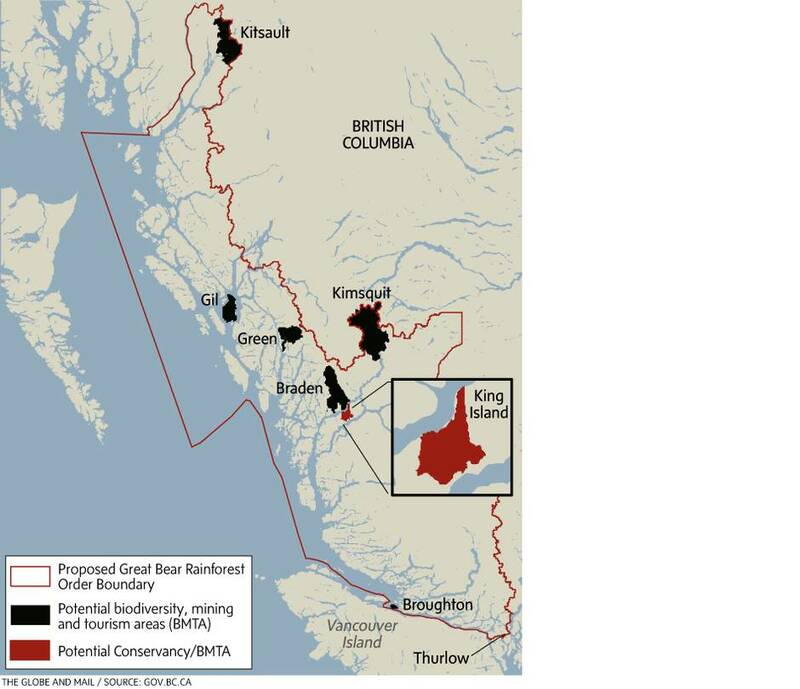 The campaign to save old-growth forests in the vast stretch of coastline that makes up the Great Bear Rainforest is now two decades old and it is just approaching the finish line, with final approval of an agreement to govern land-use in area expected this fall. The initial plan was cooked up behind closed doors between environmentalists and forest company executives who had been forced to the table under threat of market boycotts. When the news leaked out, First Nations leaders on the coast were furious that this cabal was making plans for these lands in their traditional territories. The damage done would take years to undo. Earlier this week, the B.C. government announced a final land-use plan to protect 3.1 million hectares in the central and north coast of British Columbia from logging. Years of technical work has gone into the fine details of what is needed to maintain ecosystem integrity – habitat for grizzly bears and marbled murrelets – in this temperate rainforest. The Great Bear Rainforest refers to a vast stretch of B.C.’s north and central coast, the largest coastal temperate rainforest on the planet. Since 2000, several agreements have been implemented to reduce logging, but the final pact, if adopted by the province in the fall, will ensure protection of 70 per cent of the old-growth forests in the region. 6.4-million hectares, of which 3.1 million hectares will be under various forms of protection from logging. Mining and tourism will be permitted in some areas that are off limits to logging and hydro-electric power projects. Environmentalists called off international marketing campaigns against B.C. forest companies in exchange for protection of wildlife, cultural and ecological values. The Rainforest Solutions Project is comprised of Greenpeace, ForestEthics Solutions and the Sierra Club of B.C. The Coast Forest Conservation Initiative includes Western Forest Products, Catalyst, Interfor, Howe Sound Pulp and Paper and B.C. Timber Sales. Other forestry companies operating in the region will still have to follow the new rules. How would the agreement be policed? Companies would file their forestry plans under the new “ecosystem based management” regulations and forest ministry staff would be responsible for ensuring the terms are met. Along the way, the ambitious collaboration almost derailed many times. Coffee cups were flung in anger and peace was brokered in the strangest places. Now, the details are up for public comment, but the last of the heavy lifting will be done in private meetings with aboriginal leaders who represent the 27 First Nations in the region. They are still are negotiating the other half of this deal: what benefits the Great Bear Rainforest will bring to its human residents. When the campaign to stop logging in the region was first mapped out in the mid-1990s, the idea was to replicate the anti-logging victory in Clayoquot Sound on a larger scale, recalls veteran campaigner Valerie Langer of ForestEthics Solutions. One logging company in particular was going to be targeted with a campaign aimed at its customers. “We had our sights set on taking Interfor down. We would make them so toxic no one would buy from them,” she said. But when a representative of the German publishing industry came to B.C. and sat down with both sides, he challenged them to work out their conflicts. He represented $600-million worth of paper publishing contracts in B.C., and his clients wanted to be assured they were buying “clean” paper. It was a pivotal moment that brought industry to the table. After years of trench warfare, relations were toxic. A mediator was brought in who decided a change of scene was needed. The two sides were invited to an Elton John concert, where they would share a private box. “So we are all in a box, talking together, and we start joking around about what people might have to do to get the forest industry to stop logging in intact watersheds while we sit down to talk,” Jody Holmes said. Ms. Holmes is a conservation biologist who was tasked with transforming the concept “save the rainforest” into the science of how much preservation was enough to maintain a healthy forest. Walrus leads a group to the grandmother tree estimated to be 1,300 years old. With about 100 valleys temporarily saved, the detailed work needed to begin. It would take complex algorithms to establish where the old growth is and what habitat is required to sustain wildlife, while at the same time ensuring no one logging company or community would carry an unequal share of the burden. Rick Jeffery, president of the Coast Forest Products Association, was brought in as the forest industry’s lead negotiator on the Great Bear Rainforest in 2012, when the project was once again threatening to implode. At this point, the First Nations had laid out their objectives – to incorporate benefits for their communities. “It turns out you have to make sure you take care of the communities – that’s a pretty big piece of the story,” he said. Mr. Jeffery said industry and environmental organizations have invested millions of dollars in figuring out how to carve up the 6.4-million-hectare region so that 70 per cent of the old growth is protected. The complexity of the trade-offs was taking so long to sort out that both sides were having a hard time keeping their organizations at the table. “Then, all of a sudden, we made a breakthrough with something called the rapid assessment tool – the RAT. It allowed us to run scenarios quickly.” The RAT could quickly calculate effects of preserving selected parcels of land with the inputs of geography, wildlife habitat, and timber harvesting rights. The group that he represents does not include all the forest companies operating in the region – TimberWest is an outlier and is facing intense pressure over its current operations. But Interfor almost brought the project down early on when the company’s representative walked away from the table. “It was a crisis point,” said Catherine Stewart, who led the negotiations for Greenpeace for the first decade. “Our agreement with the companies was always that if one company pulls out, we are free to resume contact with their customers.” Interfor’s customers started getting calls urging a boycott. But some of the forest companies still at the table were buying wood chips from Interfor, and a decision was made to put the heat on them as well. “Even our colleagues in the environment movement were pretty worried the deal was going to implode – but in the end it worked and everyone came back to the table and resumed serious negotiations. It was a gamble. We were taking a chance it could all fall apart. But throughout this process, people have taken big risks,” Ms. Stewart said. The rockiest road has been bringing the 27 First Nations in the region on board. Dallas Smith, president of the Nanwakolas First Nations, which represents most of the communities in the southern half of the Great Bear Rainforest, said the initial concept was met with hostility. Two parties were locked in a battle over their traditional territories without considering the wishes of First Nations. “We felt like children in a divorce,” he said. Even the name, the Great Bear Rainforest, was a non-starter. “I hated it. I thought it was insulting,” he said. Over time, he has accepted that there are benefits to having a brand that can mobilize support. Using that name, environmental organizations raised $60-million to start a fund for First Nations in the region. It was another pivotal moment that would reshape the direction of the final product. Now that marine plans and land-use maps are in place, he said, the provincial government must complete the agreements that will determine how this will help those who live in the region. “My communities have to become better places to live as a result of the ecological protection and the resource development we’ve agreed to in our territories.” Issues around ferry service and trophy hunting are on the table, but to Mr. Smith it means jobs in a sustainable resource industry and in helping manage the protected areas. 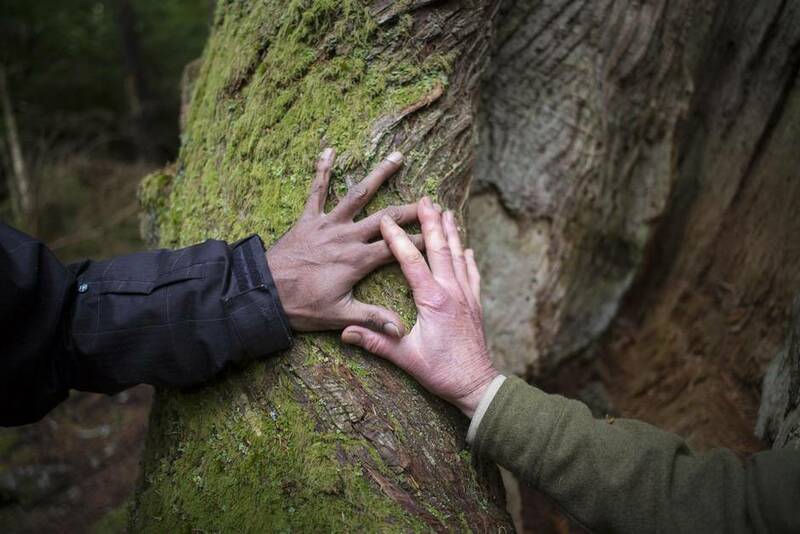 Walrus and Kumi Naidoo place their hands on the grandmother tree. 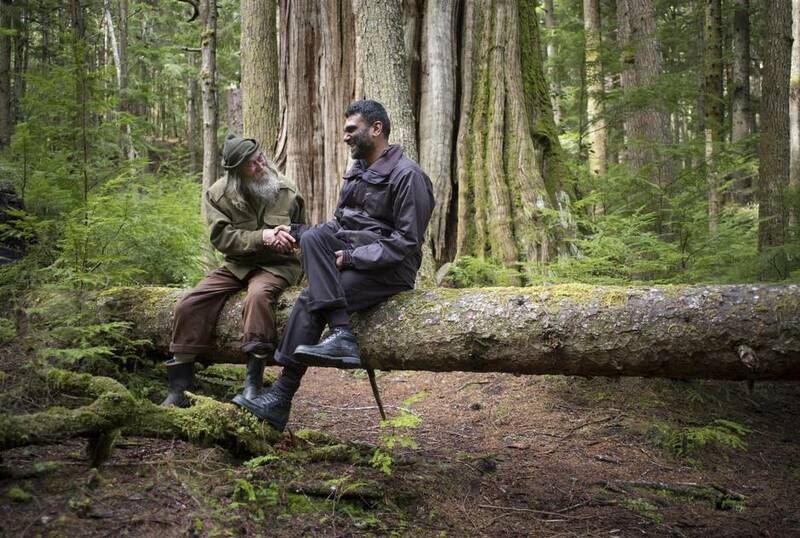 This spring, Walrus led Greenpeace International’s executive director, Kumi Naidoo, through the trails of Hanson Island to a towering cedar he calls the grandmother tree. It has been growing here for 1,300 years and has charring from a fire 400 years ago. The grandmother tree would have been turned into 2x4s without Walrus’ efforts. “This was planned to be logged right here,” Walrus explained. 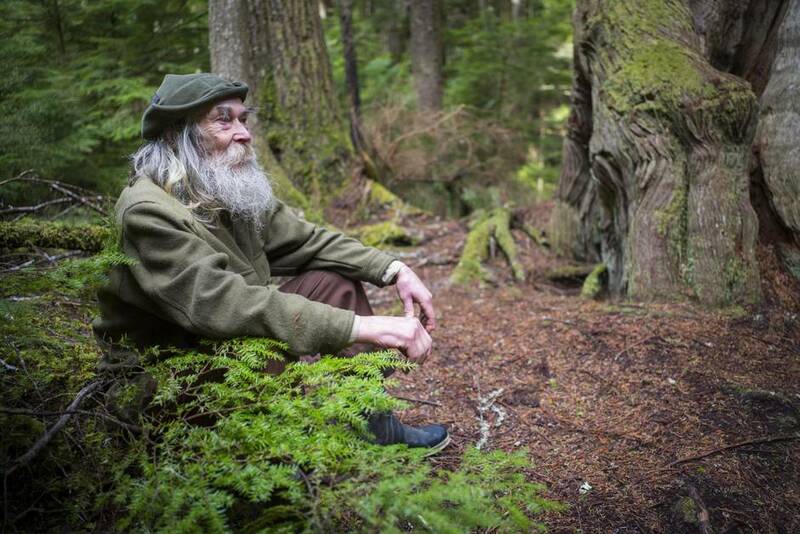 “I went for broke and said, ‘Well, let’s protect the whole island.’” He helped map thousands of trees on the island that show the marks of past First Nations use, eventually forcing the province to protect the island, which is now one of the gateways to the Great Bear Rainforest. Today, the Kwakwaka’wakw children come to him for tutoring, to learn about the trees that prove their ancestors practised sustainable harvesting more than 1,000 years ago. Mr. Naidoo was a human rights activist in South Africa before he moved to Amsterdam to head up Greenpeace, and he sees environmental objectives entwined in social justice. This spring, he visited First Nations communities before travelling to Hanson Island to see the region for which his organization has spent almost 20 years fighting. 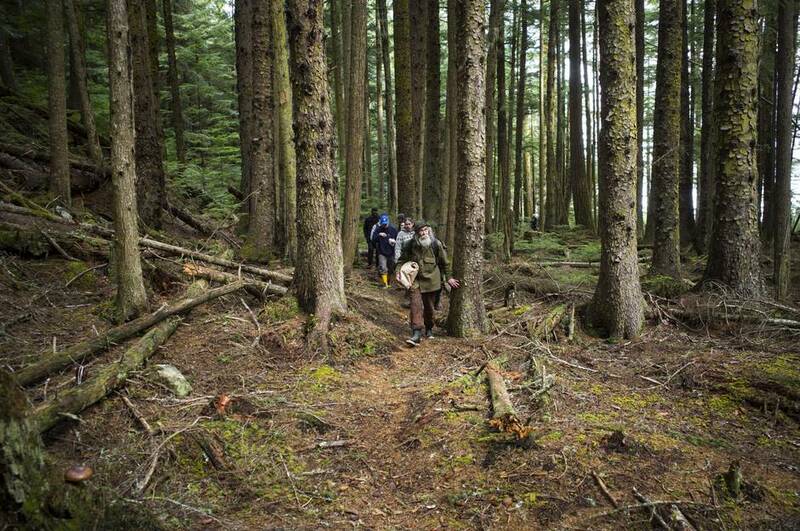 “Walking in an old-growth forest is very special like no other experience,” he said. Mr. Naidoo said later the journey to this agreement offers knowledge that will be carried over into other Greenpeace campaigns.